Does your child often suffer from sore throat, fever, pain while swallowing, hoarseness, visibly red and swollen tonsils in the throat? These signs could be symptoms of tonsillitis (inflamed tonsils). Tonsils are lumps of tissue at the back of the throat on either side. As part of the lymphatic system, the tonsils and adenoids function to clear away infection by trapping the germs entering the mouth and the nose. Tonsillitis is most common in children over age two. Almost every child in India suffers from it at least once. Children between 5 and 15 years of age are most vulnerable to Tonsillitis which is caused by bacteria, while that caused by virus is more common in younger children. Adults rarely suffer from tonsillitis. Tonsillitis is caused by both bacteria and virus. Bacterial or a viral infection (spread by exposure through coughing and sneezing of the infected). Viruses like adenovirus, rhinovirus, influenza, coronavirus, and respiratory syncytial virus cause acute tonsillitis. Bacteria such as Group A ?-hemolytic streptococcus (GABHS) causes strep throat. Acute Tonsillitis (acute sore throat) caused by a virus or bacteria. Recurring Tonsillitis: Seven episodes of tonsillitis or throat infections in a year and repeated bouts of the bacterial infection within a few weeks is sign of recurring tonsillitis. Chronic Tonsillitis: Recurring tonsillitis infections causing chronic sore throat, bad breath and persistent tender cervical nodes. Peritonsillar Abscess (PTA) or Quinsy: Is an abscess in the peritonsillar region. Severe throat pain, fever, drooling, foul breath, difficulty opening the mouth, and altered voice quality are the symptoms. Peritonsillar abscess is caused by untreated tonsillitis infection lateral to the tonsillar region. Tonsillar Hyperplasia or Tonsillar Hypertrophy: Abnormal enlargement of the palatal tonsils symptoms of snoring, difficulty in swallowing. Tonsillitis treatment is usually based on the type of tonsillitis, whether caused by a virus or bacteria. Viral tonsillitis: A tonsillitis caused by a virus does not require antibiotics. The body will recover normally in 7 - 10 days. Medication may help to suppress symptoms. Bacterial tonsillitis requires a course of antibiotic treatment. A recommended 10-day dose of antibiotics cure tonsillitis infection thoroughly. Incomplete treatment may cause serious complications. Short term therapies of 3-5 days are also helpful to treat the condition depending on the individual case. Tonsillectomy or surgical removal of the tonsils may be preferred only as the last option when the Tonsillitis medicine or other therapies does not work. 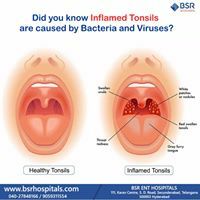 Frequently recurring tonsillitis that causes obstructive sleep apnea, difficulty in breathing or swallowing may require tonsillectomy, besides conditions such as chronic tonsillitis and removal of Peritonsillar abscesses. Latest Technologies and Equipment: BSR applies latest technologies, Zeiss Microscope, Lasers, Karl-Storz Nasal Endoscopic equipment with HD operating cameras and monitors, that enable accuracy in performing surgeries. Our in-house Clinical and Biochemical Laboratory / Radiology help in quick diagnosis and treatment making it convenient for our patients. Patient Centric Approach We are a team of expert specialists who ensure every patient gets the treatment they deserve. Our high quality treatment is personalized and affordable. Doctor discuss the treatment plan with the patients and educates them on the condition and treatment for better understanding and cooperation of the patient.